A Teak Outdoor Sectional that epitomizes the concept behind the relaxation and functionality of the best lounging and tanning platforms, the Pacific Teak Outdoor Sectional with a Left side arm delivers on all levels. 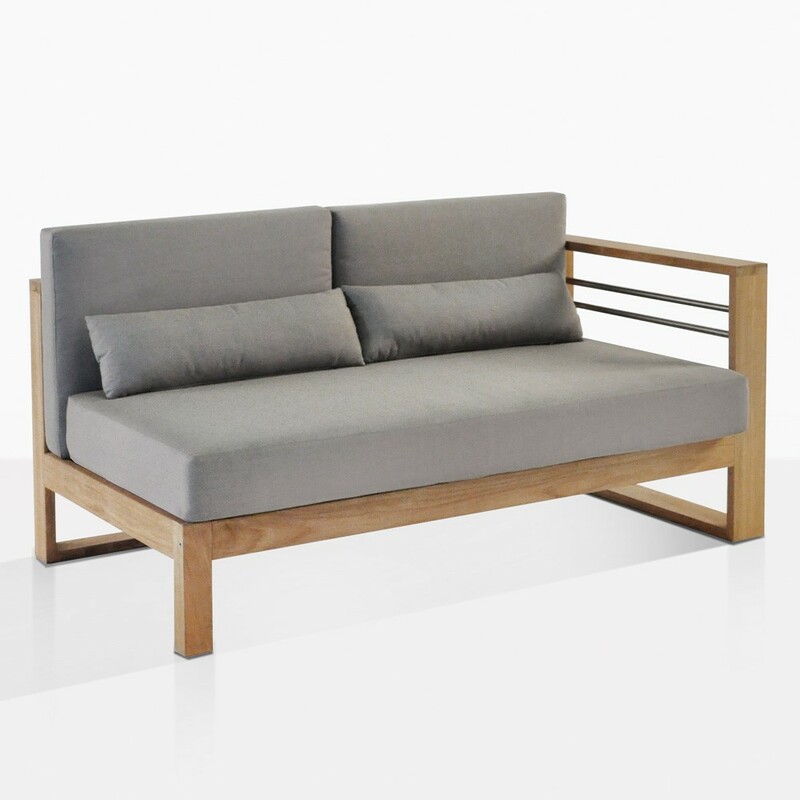 If ever there was a teak outdoor sectional with all the attributes of the best relaxation furniture as well as the hip, edgy, contemporary looks that so many people demand then this is the one. W57.5" x D32" x H31"
The Pacific Teak Outdoor Sectional is available with both a left and a right arm configuration to allow you to complete the stunningly good looking, very linear Pacific Outdoor Sectional. It is not mandatory that you use this as part of a sectional though. As a standalone piece, this teak sectional piece allows you the room for relaxation and the surface area to lounge about outdoors. The Sunbrella® cushions offer excellent comfort and clean looks for a piece of furniture that you will no-doubt, be spending a ton of time on in the spring and summer soaking up rays or reading while enjoying a drink. It shouldn’t be a forgone conclusion though, that this teak sectional is only useful outdoors. In fact, you could easily place this next to a window indoors to capture the raw, edgy industrial design cues indoors. The contrast of the warm golden color tones of the Grade-A teak works so well with the smooth brushed finish on the stainless steel pieces. Some might want it to be an indoor piece to keep that great contrast, while others might be seeking out that familiar silvery edge that teak develops over time. The patina looks just as amazing with the combination of 316 marine grade stainless steel and the weathered silvery hints as it matures outdoors. The linear, clean, chiseled and muscular look makes this teak sectional an excellent transitional piece. It is at once: modern, urban, hip, and yet, it pays homage to many of the best pieces from the mid century modern era. This teak outdoor sectional is perfect for stretching your arms out on to get your relaxation time in, but it can also take on a decidedly business like feel. The upright posture of the frame and the lumbar support give you that attentive and responsible feel that the best seating pieces all have. Is it possible that a piece so handsome could offer the best in relaxation and functionality at the same time? 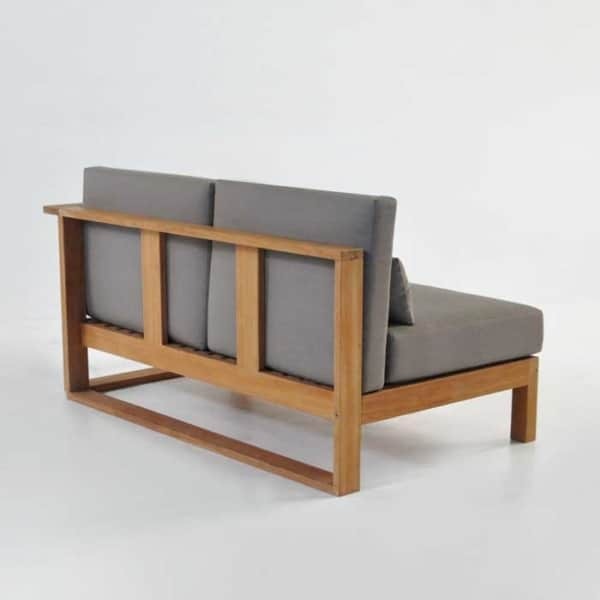 The arms on these teak outdoor sectional pieces are positioned so that the arm is on the named side, while you are in the sectional piece facing forward. For instance, the right arm teak outdoor sectional means there is an arm on the right while you’re occupying it, the left arm denotes the arm position is on the left. The Sunbrella® cushions, which maintain their aesthetic over time are fade free and offer plush comfort both in surface feel, and in the integrity of the cushion. These cushions as shown are all included in the price; even the lumbar pillow. 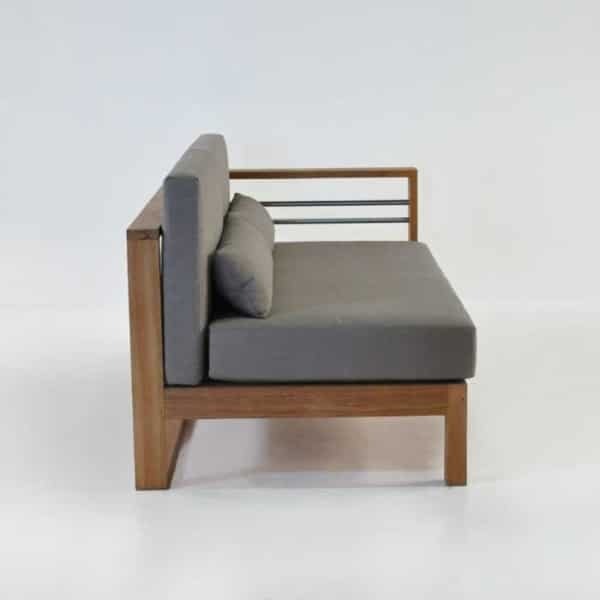 The deep surface and the medium range seat height make this an excellent place for a short outdoor nap, but also allows you to really commit to getting a full day in on the patio during the best days of summer if you want to. After the day you spent on this teak outdoor sectional in the sun, you can also enjoy a drink or dinner on it, and then spend time with someone close enjoying the sunset. It’s THAT kind of teak sectional.